There's one round of Champions League group stage fixtures to go before the knockout stages begin following the action on Tuesday and Wednesday night, and 12 teams have already sealed their progress into the draw. However, ahead of match day six, there's plenty of different possibilities over who goes through, who goes out, and who plays football on Thursdays in 2019. Here's a breakdown of who's in the hat, and what the remaining teams need to do on the final day to seal progress. Atletico Madrid's 2-0 win over Monaco on Wednesday assured their progress to the last 16​, and they've taken top spot too as Dortmund somehow failed to beat Club Brugge at home. Diego Simeone's side will ensure top spot with a victory in Belgium next time out, but Dortmund will need to better their result to finish in first. Both teams are through regardless. Poor old Thierry Henry and Monaco - ​who were beaten by Atletico on Wednesday - have one solitary point. Club Brugge will move into the Europa League. Barcelona have assured they're taking top spot in Group B after beating PSV, courtesy of some quite ridiculous stuff from Lionel Messi, and a goal from Gerard Pique. The real story in this group though is for second place. 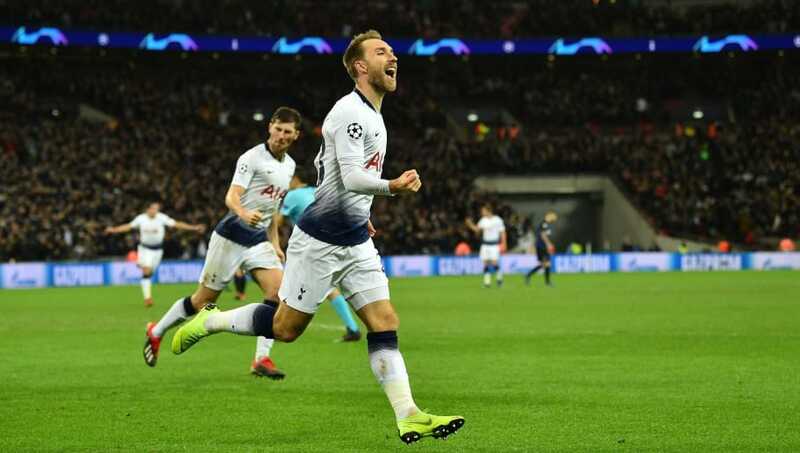 Tottenham have given themselves a fighting chance of progressing to the next round after ​crucially beating Inter on Wednesday night, through Christian Eriksen's goal. The two teams are locked on seven points, but Spurs lead on head to head going into the final game. Here we've got the other very interesting group for match day six. It's close - Napoli have nine points, PSG eight, Liverpool six. PSG ensured it'd go to the wire by beating Liverpool 2-1 in Paris, and they will progress with a win over Red Star next time out. Liverpool, however, meet Napoli at Anfield - and goodness it's a big one. There's a lot of permutations, but Liverpool know they absolutely must win if they are to go through - two clear goals would do the job - but 1-0 might not necessarily be enough, and a one-goal win with Napoli scoring definitely wouldn't be. FC Porto are in the privileged position of first place in Group D, and they'll stay there after beating Schalke. Both teams are however qualified for the next round, after Lokomotiv Moscow beat Galatasaray and ensured they each had amassed enough points to reach the last 16. Lokomotiv and Gala are separated by a point going into the final match day. ​Bayern Munich & Ajax both qualified for the last 16 with wins over Benfica and AEK Athens respectively. Bayern currently top the table on 13 points - two above the exciting Dutch outfit - but Ajax will win the group if they beat Bayern in Amsterdam on match day six. The two teams drew 1-1 in the reverse fixture. Benfica are assured of a Europa League place regardless, as AEK have lost every game so far. ​Manchester City are through, but not yet assured of top spot due to the fact Lyon beat them at the Etihad earlier in the campaign. City do lead the French team by three points and would have to lose at home to Hoffenheim to even have a chance of finishing second, with Lyon needing to win to have a shot of sealing top spot themselves. Lyon need a point to progress next time out, but the trouble for them is they'll be travelling to face a Shakhtar team who know they will progress at Lyon's expense with a win. Hoffenheim need to win and hope Shakhtar lose to progress into the Europa League. Roma and ​Real Madrid's progress was confirmed on Tuesday night before they had even kicked off, and Real went on to seal top spot by winning in Rome. As it stands, CSKA would need to better Viktoria Plzen's result in the final round of games to make the Europa League. It's a big ask though, since they'll be travelling to the Bernabeu. Juventus' win over Valencia, coupled with Marouane Fellaini's injury time winner for Man Utd against Young Boys, sealed progress for the two heavyweights in Group H on Tuesday. We say 'heavyweights' loosely when we're talking about United, anyway. The Bianconeri are likely winners of the group as they face the Swiss outfit in the final game, and they are expected to win. They need to do so, because if United win and Juve don't Jose Mourinho's side will top the group. Imagine what he'll say if they manage to pull that off. Valencia are assured of a Europa League spot, sitting on five points at the moment. The final group stage games take place on December 11th and 12th, with the draw for the last 16 taking place on December 17th in Nyon.